112 India App: The government in India is planning to launch an integrated support system with a single emergency number which will be 112 in case of all kinds of emergencies for its citizens. This means that seeking help in case of emergencies will become easier. This emergency number is launched by the ERSS, which is the Emergency Response Support system. The ERSS is designed by the Centre for Development of Advanced Computing (CDAC). The 112 India App is a government of India initiative. If a person finds himself in an emergency situation, he can take the assistance of local emergency service delivery departments with the help of the app. 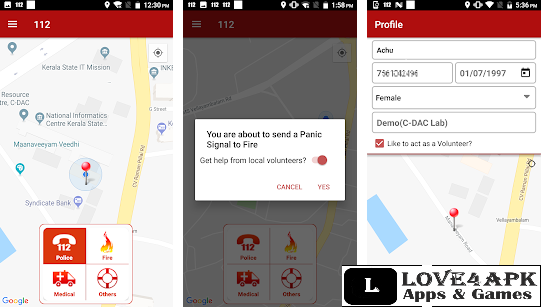 As soon as an emergency situation arises, the app will send emergency alerts with details of the user like his name, age, emergency contact number etc along with a call to 112 to the State Emergency Control Room. From here the system will forward the emergency alert to the close online local volunteers. The volunteers will get an emergency alert and they can mark their consent to help the person in distress. Then the volunteer’s details along with the photo and contact number will be sent to the person in distress. The 112 India App is introduced by the Indian Government mainly to help when a person needs an emergency. The app also has a very unique option for women. To ensure the safety of women and children, the app has an option called SHOUT. This can be used exclusively by women to request for immediate help from the nearby registered volunteers. The 112 India App comes with a single emergency number which is 112 across the country so the citizens do not get panic and dial this number easily. The app provides effective emergency response services for all the citizens of the country involving local volunteers from citizens. The citizens can request for help with Voice call, SOS, SMS, Email and Panic buttons. The app identifies automatic location identification of the person in distress. The 112 India App will offer a lightning fast emergency response from the nearest emergency response vehicle. The app promises to make the operations citizen friendly and transparent. The app provides citizen profile management and feedback mechanisms. The app also tracks the progress of the incidents and the services undertaken and also sees that the emergency services are taken to the next level. The 112 India Mobile app is available on both the Google Play store and the Apple App store Or you can visit its official website 112.gov.in by the Ministry of Home Affairs. When a user uses a smartphone, he only has to press the power button three times and the panic call is activated to the ERC. And if you are using a normal phone, you need to long press the number 5 or 9 to activate a panic call. The 112 India App is planned to be launched all across the country by next year.